Gardeners often encounter unique and colorful insects in their gardens. The Luna moth is one of North America's most beautiful insects. The large, pale green moth is often a symbol of the night. Luna was the Roman goddess of the moon and in 1758, Linnaeus thought that it was an appropriate name when he dubbed it Actias luna. While much of moth and butterfly lore seems to focus on the afterlife, consider the Luna. Named for the goddess of the moon, with a purpose only dedicated to reproduction. It only seeks a mate as its sole job in life. Many people believe that an encounter with a Luna is to remind them that life is short and to focus on the importance of love and family. The Luna moth is found throughout eastern North America from northern Mexico to Saskatchewan, in areas where there are hardwood forests. Its host plants (plants that the caterpillars can use for food) include hickory, sweet gum, birch, alder, persimmon, sumac and walnut. Urbanization and habitat loss has seen a decrease in the population of these beautiful creatures, so it is becoming increasingly rare to see one. These are night-flying insects and they are attracted to light. This is known as phototaxis. Some believe that moths use the moon for orientation and the attraction to street lights is a case of mistaken identity. 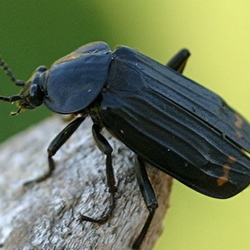 Most people encounter them near porch or garage lights, but they are insects of the forest and it is uncommon for one to venture in to urban areas. People often go their whole life without seeing one. Here in rural West Kentucky, I am blessed with quite a bit of hardwood forest growth nearby and often see several each season. It never grows old. They are just as beautiful and mysterious 40 years after spying my first and still take my breath away. Adult Luna moths and other members of the Saturniidae family do not have working mouth parts, so do not feed. They live about 7 days at the most and their sole purpose is to find a mate and breed. Female Lunas produce a pheromone that males can detect from over 5 miles away. 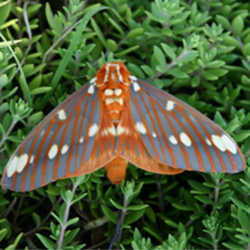 The one in the image above is a male with the wide, feather shaped antennae. It is thought that they help him detect the pheromones. After mating, the female lays her eggs on one of the host plants and the bright green caterpillars hatch in about 10 to 12 days. They feed and grow for about three weeks, then spin a cocoon and pupate. It takes about two weeks for the pupa to mature unless the moth is diapausing. Diapause is a condition that allows an organism to survive natural climate changes such as winter. Gardeners often find pupae in mulch and leaf litter when doing spring clean up, so remember to leave things a little messy. Gardeners can encourage these beautiful insects in a number of ways. Planting a selection of host plants is important. The females will be attracted to them and when they lay their eggs, the resulting caterpillars will eat and live in your garden. Gardeners who grow milkweed to encourage Monarchs understand how important it is to keep a healthy selection of food sources available. 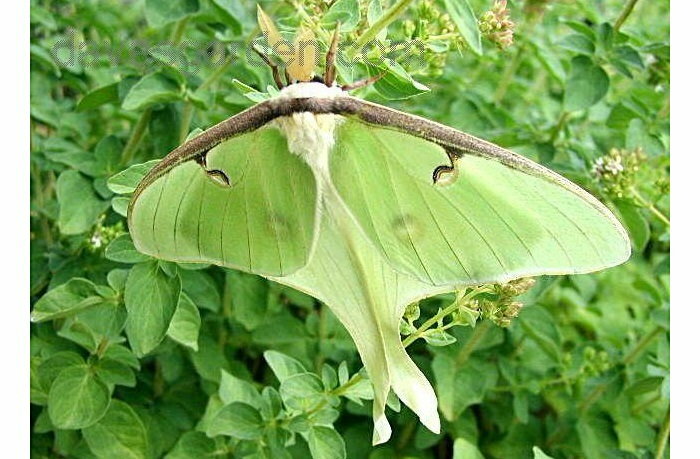 Since the adult Luna moths do not eat, you need to make sure your garden is caterpillar friendly. Pesticides can kill your little Lunas before they have a chance to grow up. Another important thing is to leave some leaf litter and mulch so that the cocoons are undisturbed. When the Luna moth caterpillar pupates, the cocoon drops to the ground and remains there until it is time to eclose. Eclosing is when an adult emerges from a cocoon. The adult emerges with crumpled wings and climbs to a perch where they gradually expand and harden over about 3 hours. It is then ready to fly off into the night and hunt a mate. Females usually stay in the immediate vicinity of where they eclose. Chances are, proper food sources are nearby and so she hangs out where she will lay her eggs. The males are the ones that you usually see roaming the night. Luna moths are special and rarely seen. They do not live long and are only active at night. Making your garden a friendly habitat will encourage them and related species to lay their eggs and make your garden a special night time adventure. They will not be attracted not night-blooming flowers, but other moths will be, and it is always nice for humans to enjoy the scent as well. So if you want to encourage these moths, choose trees that their caterpillars can use. They are never present in enough numbers to defoliate anything, so let them enjoy the meal. Images are my own or from BugFiles. What's That Bug? The Regal Moth; Citheronia regalis What's That Bug? 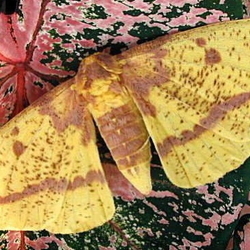 Eacles imperialis the Imperial Moth How Do Insects Survive the Winter?